266/365(+1), a photo by Luca Rossini on Flickr. Just right before starting the 365(+1) Days of NEX-7 project, I was getting really into polaroid photography. I was studying about emulsion lifting, emulsion transfer, emulsion manipulation, and negative recalling. After a lot of searching and reading, I decided to go with two different and parallel roads. I bought an original russian LC-A to shoot color slides with, and a Polaprinter to transfer the slides onto Fuji 100c instant film. The Fuji 100c is a peel-apart emulsion, which provides both the positive and the negative of the image. Thanks to this it is possible to perform image transfers, emulsion liftings and negative reclamation. While I managed to get at least one decent result, the film proved to be very poorly compatible with the Polaprinter, which resulted in several packs of sheets wasted and a lot of frustration. At the same time, I also bought a Polaroid SX-70, the super classic one: the very first instant slr in the history of photography, the first to make use of an emulsion able to self-develop even under direct sunlight (and the only one allowing incredible manipulations), one of the few slrs which, once folded, can fit in a (large man jacket) pocket, the one Andy Warhol always brought along, and the one Steve Jobs used to explain the importance of the “form factor”. Now, the original emulsion for the SX-70 isn’t produced anymore (together with all the other hugely-missed Polaroid emulsions). 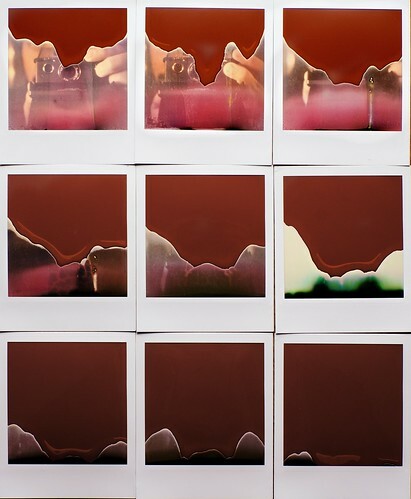 You can still find it on ebay unreasonably priced or you can go with the Impossible Project’s new emulsions, quite unstable, very artsy, still expensive. I opted for the Color Shades, with which I had a lot of fun and some good results. I particularly loved the the strong material textures and the dreamy effects that the emulsions would give to every (good) shot. However, as I said before, these emulsions are extremely unstable. And here I am, several months after the last instant shot, trying to get a decent self portrait, and instead finding myself wasting two and a half cartridges. Which were worth around fifty euros. So I’m not particularly pleased, right now. Well, I’m not unpleased either. 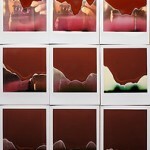 Seen together, these nine instants seem to tell quite well a story of material decomposition. Of my decomposition. As an analogue photographer. The inner corruptibility of matter against the ethereal immortality of pure information. Something like that. P.S. I may give Impossible emulsions another shot, since I just found out that they came up with a new, light resistant, formula. Have you ever used it?